In the present study, the environmental changes over the past 100 years in the Cambé River watershed in Southern Brazil were investigated. For this, a sediment core was collected to examine the distribution of metals, polycyclic aromatic hydrocarbons (PAHs), and ecotoxicological markers. The core corresponds from 1914 to 2012, which was obtained by the decay of 210Pb. Changes in the study area also were examined by: Geoaccumulation index (Igeo) and enrichment factor (EF), sediment quality guidelines (SGQs), and ethoxyresorufin-O-deethylase (EROD) activity in Poeciliopsis lucida hepatocellular carcinoma (PLHC-1) cells line. The Σ16 PAHs ranged from 242.6 to 40,775 ng g−1, with pyrogenic source at the beginning of the core, which likely corresponds to the burning of forests to establish the city and the later use of fossil fuels from 1960 to 2012. In the 1930s, most of metals presented a concentration below the background. After the 1930s, high concentrations can be associated with the intense use of fertilizers (Cd, Cu, Zn, Hg) and increases in urban traffic (Zn and Pb). Igeo showed that the distribution of Cu is considered moderately to strongly polluted, and the EF of Pb was considered as moderately polluted. 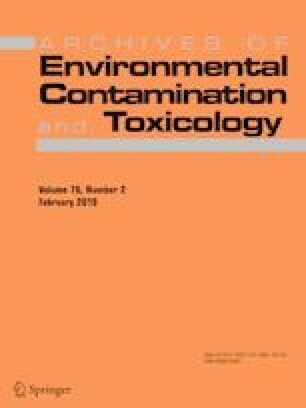 Statistical analyses showed a strong relation between the presence of the ANP, FLU, PHE, BaP, IND, and Bghi compounds and the induction of EROD activity, and no correlation with heavy metals. A prediction model for the linear regression was obtained between the ANP and BaP concentrations and the EROD activity, with an accuracy of 99%. The authors are grateful for financial support from the CAPES (Coordination of Improvement of Higher Education Personnel) and Araucaria Foundation-PR. The authors thank Dra Cinta Porte and Elizabeth Pérez-Albaladejo for the supervision of bioassays in the Institute of Environmental Assessment and Water Research, CSIC, Barcelona, ES.